You may notice a couple of things around here: I like to make meatballs and I like to make muffins. That sounds so strange. 😉 I love them both because they’re easy. And we all need some easy in our lives! 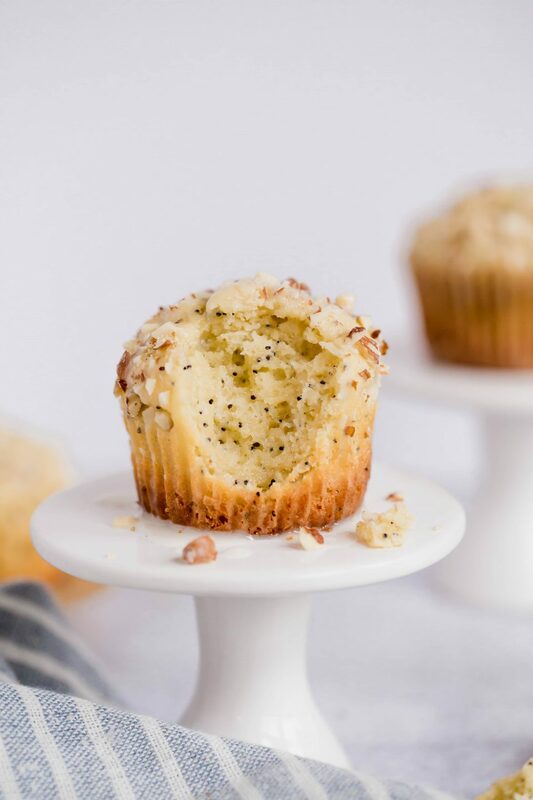 I have ALWAYS loved almond poppyseed muffins. Who am I kidding. I love all things almond-flavored. And these, my friends, are pretty much a perfect gluten-free muffin. I am actually pretty proud of myself because I started making these and then the consistency was just not right. So I made some adjustments as I went and they turned out great. Is that what “real” bakers do? Haha! I’m really excited to share this recipe with you! As I say in just about all my other recipes, I am a big fan of Bob’s Red Mill 1-to-1 Gluten-Free Baking Flour (it comes in the light blue bag). Everyone seems to have their favorite. My husband has actually created his own homemade blend, so we are experimenting with that. But for now, Bob’s Red Mill seems to be one that I get a lot of great results with! This muffin recipe would be a great base for lots of different flavor combinations. In fact, I have made lemon poppyseed muffins using a base similar to this one, so I’ll be sharing that one soon. Especially with spring/summer right around the corner. Bring on the sunshine and lemon! 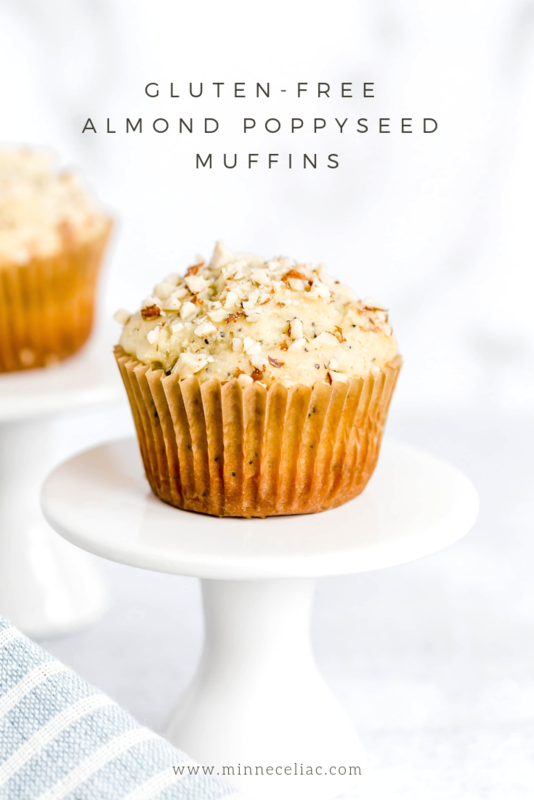 You’ll notice that I used chopped almonds to top these muffins. 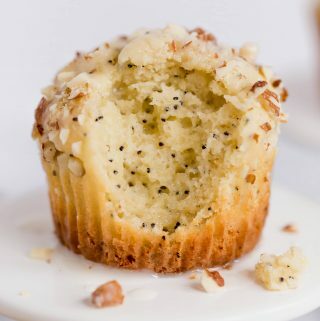 Typically, you see sliced almonds on almond poppyseed muffins. But, I have the hardest time finding safe nuts. Not just almonds but all kinds of nuts! A lot of them are processed on shared equipment which is a big no-no for me. So I just found a bag of safe, whole, raw almonds and since I’m not going to take the time to thinly slice them, I decided a rough chop would be just fine. And it totally is! As with any baking recipe, even if it’s not gluten-free, it is important to not overmix the batter. This can make the final product too dense and chewy and you want to keep them light and fluffy. 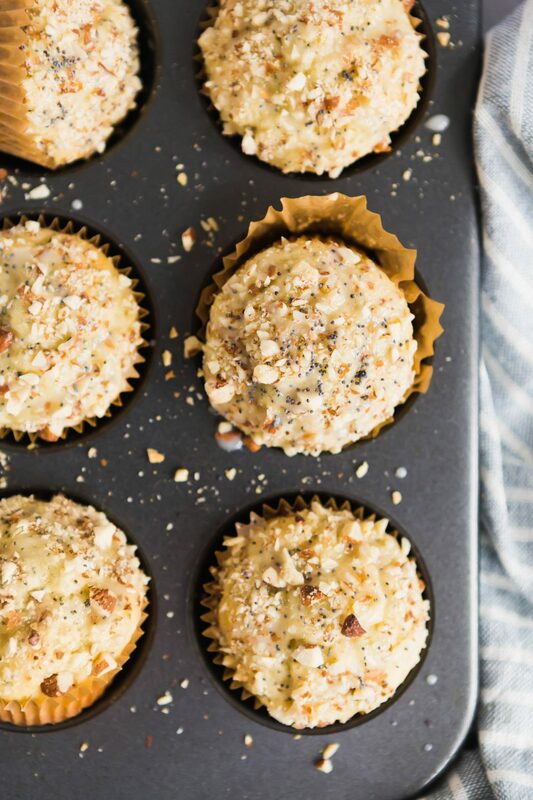 These delicious gluten-free almond poppyseed muffins are a perfect breakfast treat. 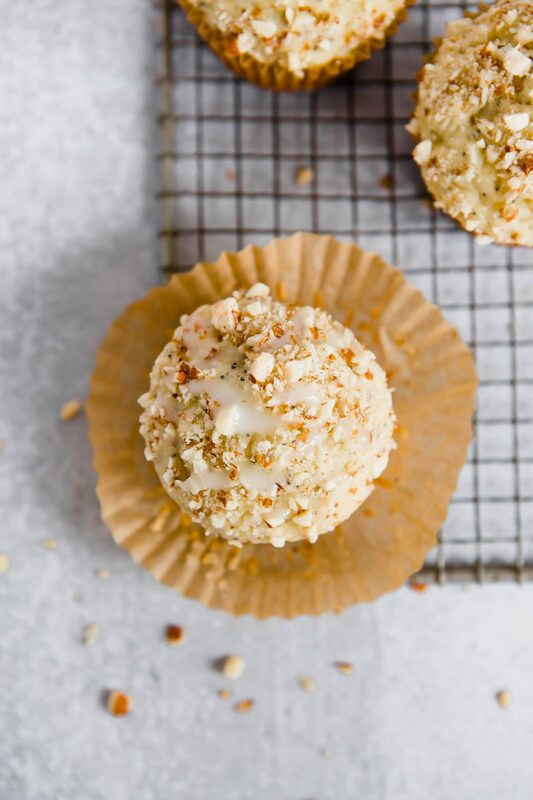 You won't even feel like you're missing out on going to the bakery when you can make these goodies at home! In a mixing bowl, lightly combine gluten-free flour, sugar, salt, and baking powder. In a separate small bowl, slightly beat the two eggs. Add in greek yogurt, avocado oil, milk, and almond extract. Mix together. Combine the egg mixture and the dry mixture. Mix until it's just fully incorporated. Pour the batter into muffin tin lined with baking cups. You'll fill them about ⅔ full. I like to use parchment paper baking cups - nothing sticks to them. Top batter with sliced or chopped almonds. Sprinkle with granulated sugar. Bake at 350 degrees for 18-20 minutes until toothpick inserted in the center of muffin comes out clean. Cool completely and drizzle with almond glaze. To make the glaze, just mix all ingredients together until it is smooth. It might be lumpy at first, but just keep mixing! I made a simple glaze to go on top which adds that extra burst of almond flavor. I’m thinking these would be a great addition to your Easter brunch coming up!